OK, moving on. I worked with him side-by-side, we attended group functions and interacted as most coworkers do. During the course of these interactions, we both felt there was something between us, but with working 15 hour days among a group of people and no time off, we never spoke of our affinity for one another. As time went on, I began to think that I was being overly intuitive about his feelings for me and having that crusty coating at the time, I soon let logic and reason take over any notions of budding romance breaking through the shell. And eventually, it was time to go back home to the US and it became business as usual and sadly, we didn’t speak again for 12 years. Great blog, story, I will come back, sure ! Paris is a great place to be in love. Enjoy France and thanks for sharing! By the way, while in Paris you should check out “Rosa Bonheur” in the “Parc des Buttes-Chaumont.” It was my fav place to hang out on spring/summer evenings for a drink outside with friends. It’s in the parc, so if you walk around long enough you’ll find it on the main path that goes around in a big circle. Wait until the weather gets better though. Salut, Sarah! Sounds like a deal, thanks so much for the suggestion and for reading! Sounds funny because Paris seems to be the City Of Love to everyone… except me ! 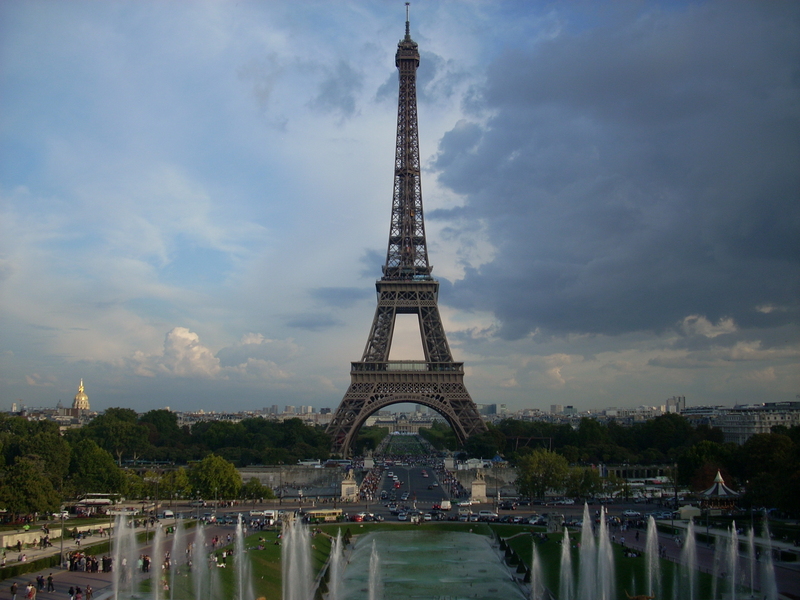 Maybe my City Of Love is meant to be somewhere else ?!…. Hmmm, that is a very interesting thought, my English thinking friend! You may be right, any place that has a particular internal pull for you? May be something to ponder…? A lovely story, all the best. Thanks and same to you, FC! What a wonderful, romantic story! Expatriotgames : again OMG ! everything is so relevant, I experienced a similar story, I had that “good-bye-hug- I-doubt-we-will-see each-other-again- because ?”, you know there’s a spark but can’t quite pluck the courage to take the first step. I left it for only 2 years…not 12! we couldn’t say anything…because of the distance !, me in the UK (I am French), him in Paris ( he’s French too), that would never work ! but thanks to the Internet marvel… and long “double-entendus” emails, we met up in Paris during the summer whilst I was visiting an old friend, he’d travelled from Troyes ( not “3 “;)) just to meet me for a lunch and this is how it all started, he’d already decided he’d leave his job in France to work in the UK before we got together, and once the Flame was declared, he moved in with me in February for my birthday, we have not been separated since November 2001, are now married, and even if he is my Soul Mate, I think his love for England did help us to get together and Paris was the cherry on the cake ! Wow, great stuff, Steph ! Paris is just that sort of place, isn’t it? What a wonderful story to lend even more credence that you CAN fall in love and find your soul mate and live the cliche. Thanks so much for sharing this…now, I want to know more about these emails and more detail on how the two of you transitioned to the UK and furthermore, why you feel so connected to the UK, being French. Most excellent and hope to hear more! Thanks for reading and sharing your story! Absolutely! In returning ‘home’ as you say, it was very refreshing to not have to ‘work’ just listening, but then I also had a subtext going in the back of my mind that English doesn’t sound the same to me anymore. I may have to delve into this one in a future article, but I hear English completely differently, the collection of sounds has a different melody and rhythm after having French in my ear for a year now. Great observation, thanks for sharing it with us and keep ‘wandering’ (an aside: in the south, phonetically, this also can be construed as ‘wondering’ lol)! A really heart-warming story… so glad you finally made it! Thanks so much Rebekah, glad you found it touching. And thank you for the repost set in your lovely article, I enjoyed yours as well! i loved your story and your blog! i’ve been to Paris just the one time, but i cannot wait to go back. i guess all the cliche’s about that city are steeped in very real experiences, like yours! One of my favorite books about Paris is Almost French: Love and A New Life in Paris by Sarah Turnbull. It might be something you could relate with:) good luck with your new adventure! i’ll be stopping by to read more from you!! I totally and utterly loved this post. Have you ever seen the film Parie, je t’aime? It is a collection of short stories from different directors and how they see Paris…It has to be one of my most favourite films. I look forward to seeing more posts from you! No, haven’t seen it, but thanks for the tip and the kind words! I find your album feature also fascinating. technical question, how can I also create one? But yours has a really happy ending, which I’m glad for cause it’s a real story. All the best! Thanks so much Leah. And trust me, if it can happen to me, it can happen to anybody! Can I just say I melted inside? I just came back from Paris about a month ago because I decided to live there for 5 months just to take some gap time from college and experience something new. I loved the romanticism of Paris. I fell in love with “a tall, dark and handsome” man and from the moment I saw him I knew it was going to be something great. We had gone to cafés, he took me to bars with his friends and we loved to go dancing together. It wasn’t until the weekend before I was coming back to CA that we both learned our feelings for each other. We shared a romantic weekend that will live in my memory forever. One of the first times we went out I told him my favorite movies is Casablanca and on our last night together it was raining and we were by the Seine saying goodbye kissing and he said “We’ll always have Paris” we laughed about it, but as cliché as it all was, it was wonderful and perfect. I can only hope that one day maybe he and I will be together once more, and maybe even end up married like you and your husband. You’re a lucky woman. Bonne chance! Oh Wendy! That is an amazing story too. Please, please, tell me more! Do see him or talk to him now? Have you lost touch? Where does the relationship stand? If you can and want to share more, please do! I want to encourage you anyway I can. The impossilbe is possible, it just sometimes the timing drives us crazy; but it works to our benefit, somehow, someway, it always works out for the best. Keep us posted if you feel comfortable and thank you for reading and not being afraid to dream! We’ve been emailing each other back and forth ever since I came back (I just wrote to him yesterday). Our relationship or love affair just ended as soon as I left. For both of us a long long distance relationship is really impossible. As much as I love to dream of us with a future together its so hard because he is in his mid 20s and I’m not even 20 yet and our paths are so far apart from each other that maybe that one weekend was really our only time to share that moment. But he became such an important person to me and he just took my heart away. It scares me that he will be the biggest love of my life and I will never be truly madly in love again. Hello sweet Wendy, thanks for writing back! After such a brief but intense emotional rollercoaster, sometimes it is best to let father time sort a few things out, such as letting the initial excitement find a resting place to where it is manageable. I understand how your insides feel right now…how your heart almost hurts with having to leave so suddenly, of playing all the “what if” senarios in your mind that play in the background like a song you can’t get out of your head. I get it and understand that you are trying to find a way to get back as soon as possible and right now it seems impossible. Not to sound cryptic, but if it is meant to be, it will happen. In my case, when I had met my now hubby for the first time, neither one of us was ready, emotionally or situationally to be with one another. All the feelings were there, true, but being in our 20’s/30’s, there was too much we needed to learn individually to make it work as a couple at that time. In hindsight, I now understand this, but then I felt cheated and like something was ripped from me prematurely. Your blog name, “A Voice Within Me”, tells me that you feel very deeply and strongly. Listen to that voice and understand that it [your innner voice] will always work to your benefit if you listen and heed it. In my experience, generally speaking, many people fall into two categories: 1) those that are not afraid to dream and try even though they may lose or 2) those that dream but are too afraid that the outcome will be more than they can bear, so they never try. Ask “your voice within” which are you? If you are the kind of individual who would rather try than wonder “what if” their whole life or are you the kind that would prefer to keep the dream unrealized but in tact, “to always have Paris” and be happy that you already shared something many people will never experience; only you can decide. Thank you for sharing, please feel free to continue if you feel comfortable. Bon courage! Thanks for taking time to talk to me. It has been an emotional rollercoaster since I got back and I feel like I am drowning in my own thoughts and no one really understands me. Its been harding trying to adjust back and I do feel like I’m missing a part of me. Its like if the time from the moment I left to the time in which I am finally at peace seems so far away because this in between is eating me up. These “what if” scenarios are worse thanks to all the love going around during this time of year and I always catch myself thinking “what if I was still in Paris with him, what would we be doing on saint valentine’s day?” I am a hopeless romantic that loves the idea of this great love story and your love story has encouraged the possibility of a fairytale, but my pessimism, which could in fact just be realistic, is shooting down all those possibilities. I feel like am neither of 1 or 2 but maybe 1.5 I took a dream and made it come true by going to Paris, but when I couldn’t find a full-time job and make rent and started getting homesick I gave up and decided it was time to leave. I think it is worse. I could have not gone and known the beauty that Paris has, so I wouldn’t hurt by what I didn’t know. But then to go and only get halfway stings my every being. I do know that I am grateful and happy about the amazing experiences I had there and the life long friends I have made, because so many people my age would never dare to do what I did. But is it so wrong to also want the happy ending? 1) Find other blogs (other than mine) of those who know what the pitfalls are to finding work and acclimating to the culture. 4) Ask your new friends in Paris and most importantly, ask your dream man to help you (if you’ve not already). Make your waiting productive; that way you are still preparing and actively putting yourself in the mindset of returning, even while you wait. This “productive waiting,” can also take your mind off the hopelessness you may feel right now and inspire you in the process. Take it one step at time and you will be amazed at how quickly your next trip will take shape. Stay positive and hopeful, because we both know, dreams really can come true, so keep dreaming, Wendy! Waiting is the hardest but it is also the wisest thing to do. The positive waiting Regina is talking about is really working too. It helps staying focused on the objective on the one hand but also forces you to face the reality of things on the other. She has been inspirational to me in teaching me that there is a good reason for that waiting to be there, at that particular time, especially when you do not want to wait. It is still difficult to grasp but it works. The positive waiting takes it one step further by giving you hope while you wait and providing you with the tools that will prove necessary for the next step. Sometimes, the positive waiting, by making you see yourself in the “wanted position” makes you realise that it is not exactly what you want. Whichever comes out in the end, it is always for the better for YOU in the long run. My dad told me once that him and mom didn’t have me to be miserable in my life and that I shouldn’t be or be made miserable but aim for happiness. It took me a while to understand that somehow things are lining up for my happiness even if they seem to be going against it at times. I guess this sort of wisdom comes with age and experience but also sound advise from friends and family but also, sometimes, from complete strangers. The positive waiting is certainly one of these as, in one way or another, it will strengthen your determination or show you why it may not be what’s in for you. Good luck in your quest. As Forest’s mother said, life is like a box of chocolates, you never know what you’re gonna get. The bit that’s missing is that whatever it is… It’s chocolate and that’s always a good thing! Dear Pys: very, very well said. Thank you for sharing your marvelous insights and for the unexpected and wonderful compliment! Amazing, isn’t it Lina? We marvel about how the chance meetings in our lives change us or for what reason we had them or whether these people will come back into our lives again or not. All I can offer, is that there is meaning in all of it, whether we realize it at the time or not. It [the experience] either shapes us in a way to be more successful with the person who will re-enter our lives or prepare us for the person who will be an even better choice for us. I do hope you will not lose heart and keep believing that the right time, place and person are being prepared for you right now! Thank you for taking time to read and share part of yourself in your comments. Bon courage, my friend!